180 Degree Turn Time26.09 sec. 100 mm/65 Type983 х 2 pcs. 127 mm/54 Mk393 х 1 pcs. Initial AP Shell Velocity808 m./s. 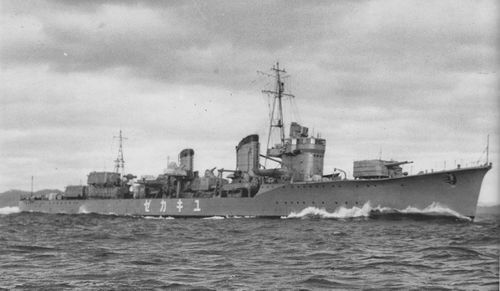 HSF Harekaze — Japanese promo premium Tier VIII destroyer. Kagero-class training ship of the Yokosuka Girls Maritime High School. She is operated by the main character Akeno Misaki. The ship mounts experimental modules that allow her to travel at higher speeds than her sister ships at the cost of stability. In the series, reduced personnel by automation allows for a single class of 30 students to operate the ship. From the series "High School Fleet". 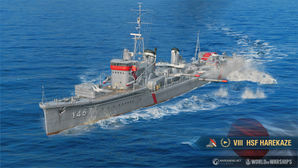 HSF Harekaze was released on both the NA and EU servers on 10 July 2017. HSF Harekaze is a fictitious Kagero-class destroyer crossover from the High School Fleet (Haifuri) anime series. In-game, HSF Harekaze features three different hulls, each mounting different main battery guns. The base hull mounts the standard Japanese twin 127mm turret found on normal Kagero-class destroyers; with this hull equipped, Harekaze plays identically to Kagero. The second hull mounts three of the twin 100mm dual-purpose turrets found as main battery weapons on the Akizuki-class destroyers. Those who enjoy Akizuki’s guns will find Harekaze comfortable to play in this configuration; though she mounts one less gun turret than Akizuki, Harekaze makes up for it by bringing another torpedo launcher to the battle, as well as packing a higher top speed and better handling characteristics. The dual-purpose guns also make her a respectable anti-aircraft platform if points are invested in the right commander skills and certain modules are equipped. The third hull mounts three US Navy 5-inch/54 caliber guns in single turrets. Harekaze is the only destroyer in the game capable of mounting these guns, which are only found elsewhere in World of Warships as secondary batteries on Tier X's Midway-class carrier. This final hull option is probably the most interesting of the three, as it converts Harekaze into a hybrid destroyer that combines Japanese torpedoes and stealth with the quick-firing guns of the American destroyer line. Unlike the standard US 5-inch/38 caliber gun found on most high-tier American destroyers, these rifles are the long-barreled 54 caliber version; they have faster traveling shells with lower arcs, as well as a fast reload. With only three guns, however, this configuration has lower alpha strike than the other options, meaning HSF Harekaze will continue to play more like a Japanese destroyer than an American one. Courting a gun battle still isn't recommended, but Harekaze is more than capable of finishing off wounded enemy destroyers should the need arise. Torpedo wise, all hulls of HSF Harekaze feature the Type 90 mod. 1 torpedo, fired from two quadruple launchers. This torpedo is Kagero's stock torpedo, traveling 10km at 62 knots for a rated damage of 17,233. While not the Type 93, these torpedoes still do significant damage to anything they hit. Overall, HSF Harekaze features the some of the most diverse playstyle options of any destroyer in the game thanks to her unique gun configurations, making her a fun and interesting ship to play. LittleWhiteMouse's Premium Ship Review: HSF Harekaze from the NA forums. Has many of Kagero’s upsides. Very versatile armaments configurations; can equip fast-firing guns in addition to the standard IJN destroyer main batteries. Alternate main batteries much faster rotation times than the standard 127mm battery. Has many of the downsides that Kagero has, although the gunnery associated downsides are somewhat solved if the player mounts Akizuki's 100mm guns, making it capable of matching gunnery-focused destroyers of other nations. More sluggish rudder shift time than Kagero. As a premium ship, HSF Harekaze doesn't have any upgrades to research. Upgrade Slot 2 provides options for specialization in certain roles, benefitting each of the separate hull options for HSF Harekaze. For the first hull option with 127 mm/50 3rd year type main guns, Main Battery Modification 2 is the recommended upgrade to increase the sluggish 180-degree turret traverse time of 30 seconds. Mounting this upgrade will increase reload time of the main guns from 6.3 seconds to 6.7 seconds. For the second hull option with 100 mm/65 Type98 main guns, AA Guns Modification 2 is the recommended upgrade to specialize in anti-aircraft duties. This upgrade increases the anti-aircraft firing range by 20%. For the third hull option with 127 mm/54 Mk39 main guns, Aiming Systems Modification 1 is the recommended upgrade. Maximum dispersion is reduced to 93 meters, and torpedo tube traverse speed is increased. Upgrade Slot 5 provides players with two options. Propulsion Modification 2 reduces the time to reaching full power by 50% when accelerating. Steering Gears Modification 2 improves the stock rudder shift time by 20%. However, the stock rudder shift time on HSF Harekaze is already fast at 4 seconds. Therefore, it can be argued that Propulsion Modification 2 is more useful, making it the better option. The HSF Harekaze has a choice of three guns, one of which is the 10cm guns found on the Akizuki class destroyers. IFHE is only recommended when using those guns, on any other configuration IFHE is not recommended. As Harekaze has sufficient firepower in terms of both torpedoes and main batteries, depending on the player's playstyle of preference, Smoke Generator is more suited for aggressive players looking to fight other enemy destroyers, while Torpedo Reload Booster is more suitable for destroyers looking to stealthily deal damage to unaware and/or unobservant enemy ships. Players that play a mix of using all possible main armaments are left to their discretion of choosing between having more torpedoes readily available or safely firing from smoke. Aggressive players are recommended to mount premium Damage Control Party II for repairing damaged modules (such as the engine or rudder) and premium Engine Boost II for better evasion. As a premium ship, HSF Harekaze comes included with Type 10 camouflage that lowers her detection radius, reduces the accuracy of incoming shells, and increases the amount of experience she earns. HSF Harekaze benefits significantly from the increased HE fire chance that both India X-Ray and Victor Lima flags provide. Juliet Charlie flags can be mounted to mitigate the increased detonation chance gained when mounting India X-ray flags. Sierra Mike flags are highly recommended to help make up for the ship’s slower top speed. November foxtrot flags are also recommended to reduce the cooldown timers for the ship’s consumables. Lastly, economic and special signal flags can be used in combination with the ship's camouflage to further increase experience and credits gained per battle. HSF Harekaze provides smoke for a friendly Izumo class battleship. Flag of HSF Harekaze. Given to players who purchased a special bundle containing HSF Harekaze. After the success of the Asashio-class of destroyers were venerated in their proficiency and capability, the Imperial Japanese determined that their next two classes of Type A destroyers would be based of the work established by this design. The first of the Type A classes became the Kagero-class destroyers. The design choices seemed justified, the Kagero-class compared very favourably with their American contemporaries. The Japanese ships had a heavier main artillery setup; although the US mounts had the benefit of dual-purpose capability. As well, although American destroyers had more torpedo tubes, Japanese destroyers had the benefit of reloads. In order to streamline design time as much as possible, the Kagero-class were nearly identical in hull design to their predecessors. Superficially, everything - even the superstructure layout - was identical to the Asashio-class. Design-wise, one of the more noticeable differences was the placement of the torpedo storage rooms; in the Kagero-class they were placed forward of their respective launchers. Propulsion wise, the new class used the same layout: 3 Kampon boilers feeding to two Kampon turbines. The greater efficiency of the newer boilers generated 2,000 shaft horsepower more than their predecessors, but this did not make any marked difference to the speed. Overall, the Kagero-class had a slightly greater tonnage and a slightly wider beam; in order to improve stability. As her predecessor, Kagero-class destroyers reused the identical armament layout as the Special Type (Fubuki-class) destroyers. Six 127mm guns found in 3 twin-gun mounts; one forward and a super firing pair aft. Kagero-class used the Type C turret mounts for their guns; which has the distinct disadvantage of not possessing the ability to angle high enough to engage aircraft, but they were fully enclosed and were lighter than previous mounts. Located amidships were the 2 quadruple-torpedo launchers in their enclosed mounts. each were provided with one reload each. For anti aircraft defence, the destroyers were armed with 25mm auto-cannons in single and dual mounts. Throughout the Second World War, the Kagero-class underwent constant service modifications. From late 1942 to 1943, further AA mounts were added, and the installed dual mounts were upgraded to triple mounts. From late 1943 to 1944, the X turret was removed to make more space for 25mm mounts. As well, many scuttles were welded over to increase hull integrity. As front-line ships, Kagero-class received priority for radar installation. In early 1944 a radar room was built into the foremast with a No.22 radar set. Later in 1944 a No.13 set was installed in the aft mainmast. In total, 19 destroyers of this class were built for the Imperial Japanese Navy; the first 15 ships proposed for the 1937 Naval shipbuilding programme, and the last 4 spilled into the 1939 programme. DesDiv 18 (Shiranui, Kagero) Participated in the Pearl Harbor attack. Participated in the invasions of the Bismarck Islands. Participated in the Indian Ocean raids. Present for the Battle of Midway. Participated in the Guadalcanal Campaign. Participated in the Battle of the Eastern Solomons. Participated in the Battle of Santa Cruz. Present for the Naval Battles of Guadalcanal. Participated in the Battle of Tassafaronga. Participated in the Battle of Leyte Gulf. Kagero was severely damaged by mine and subsequent air attack and eventually sank on 8 May 1943. Shiranui was sunk by air attack on 27 October 1944. DesDiv 15 (Natsushio, Oyashio, Hayashio, Kuroshio) Participated in the invasions of the Philippines and Netherlands East Indies. Present at the Battle of Midway. Participated in the Battle of the Eastern Solomons. Participated in the Battle of Santa Cruz. Participated in the Guadalcanal Campaign. Present for both Naval Battles of Guadalcanal. Participated in the Battle of Tassafaronga. Participated in the Solomons Campaign. Natsushio was torpedoed and sunk by submarine on 9 February 1942. Oyashio was severely damaged by a mine, then further damaged by air attack and sunk on 8 May 1943. Hayashio was sunk by air attack on 24 November 1942. Kuroshio struck several mines and was sunk on 8 May 1943. DesDiv 16 (Yukikaze, Tokitsukaze, Amatsukaze, Hatsukaze) Participated in the invasions of the Philippines and Netherlands East Indies. Participated in the battle of the Java Sea. Present for the Battle of Midway. Participated in the Battle of Santa Cruz. Participated in the First Naval Battle of Guadalcanal. Participated in the Battle of the Bismarck Sea. Participated in the Solomons Campaign. Participated in the Battle of Kolombangara. Participated in the Battle of Leyte Gulf. Participated in Operation Tenichigo. Yukikaze survived the war and was surrendered. She was awarded to China in July 1947. Tokitsukaze was severely damaged by air attack, abandoned, and set adrift on 3 March 1943. She was sunk by air attack the following day. Amatsukaze was severely damaged by air attack, run aground, and unsalvageable on 6 April 1945. She was destroyed by demolition on 10 April 1945. Hatsukaze was sunk by surface gunfire on 2 November 1943 in the Battle of Empress Augusta Bay. DesDiv 4 (Arashi, Hagikaze, Nowaki, Maikaze) Participated in the invasions of the Philippines and Netherlands East Indies. Participated in the Battle of Midway. Participated in the Guadalcanal Campaign. Participated in the Battle of Santa Cruz. Participated in the Battle of Vella Gulf. Participated in the Battle of the Philippine Sea. Participated in the Battle of Leyte Gulf. Arashi was sunk by surface gunfire and torpedo on 7 August 1943, during the Battle of Vella Gulf. Hagikaze was sunk by surface gunfire and torpedo on 7 August 1943, during the Battle of Vella Gulf. Nowaki was sunk by surface gunfire and torpedo on 26 October 1944, during the Battle of Leyte Gulf. Maikaze was sunk by surface gunfire during the raid on Truk on 17 February 1944. DesDiv 17 (Urakaze, Tanikaze, Isokaze, Hamakaze) Participated in the Pearl Harbor attack. Participated in the Bismarck Islands invasions. Participated in the Indian Ocean raids. Participated in the Battle of Midway. Participated in the Guadalcanal Campaign. Participated in the Battle of the Eastern Solomons. Participated in the Battle of Santa Cruz. Participated in the Battle of Kula Gulf. Participated in the Battle of Kolombangara. Participated in the Battle off Horaniu. Participated in the Battle of Vella Lavella. Participated in the Battle of the Philippine Sea. Participated in the Battle of Leyte Gulf. Participated in Operation Tenichigo. Urakaze was torpedoed and sunk by submarine on 21 November 1944. Tanikaze was torpedoed and sunk by submarine on 9 June 1944. Isokaze was sunk by air attack on 7 April 1945 during Operation Tenichigo. Hamakaze was sunk by air attack on 7 April 1945 during Operation Tenichigo. DesDiv 10 (Akigumo) Participated in the Pearl Harbor attack. Participated in the Bismarck Islands invasions. Participated in the Indian Ocean raids. Participated in the Battle of Midway. Participated in the Guadalcanal Campaign. Participated in the Battle of Santa Cruz. Participated in the Battle of Vella Lavella. Akigumo was torpedoed and sunk by submarine on 11 April 1944. Launching of Kuroshio, 28 October 1938. Launching of Isokaze, 19 June 1939. Amatsukaze undergoing speed trials, 17 October 1940. Nowaki underway, 14 April 1941. Shiranui undergoing repairs at Maizuru after being torpedoed by USS Growler, circa 1942. Stille, M., Wright, P. (2013). Imperial Japanese Navy Destroyers 1919-45 (2): Asashio to Tachibana Classes. London, UK: Osprey Publishing Ltd.
Chesneau, R., Gardiner, R. (1980). Conway’s All the World’s Fighting Ships, 1922-1946. London, UK: Conway Maritime Press. This page was last modified on 11 February 2019, at 05:16. This page has been accessed 98,817 times.